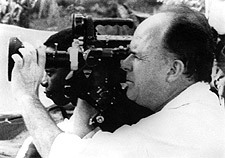 Jean Rouch's (1917–2004) breakthrough work in cinéma vérité in the 1960's helped inspire the direct cinema movement in the U.S. and the nouvelle vague (New Wave) in France where he was a key figure in the Cinémathèque Française and the founding director of the Comité du film ethnographique at the Musée de l'Homme. He was a director of research of the Centre Nationale de la Recherche Scientifique for over 50 years; teaching at the Ecole Pratique des Hautes Etudes. Rouch's long career was inextricably intertwined with the transforming world of West Africa where he first worked as a civil engineer during World War II. Far in advance of contemporary rethinking of both anthropology and filmmaking, Rouch was developing an entirely new kind of documentary film practice that blurred the boundaries between producer and subject and fiction and reality. His African work, characterized by innovations such as "shared anthropology" and "ethno-fiction," is noted for its embrace of both the daily life and imagination of a new generation of Africans. His works capture the emergence of Africa in transformation, and the worlds of displaced migrants in Accra, Ghana (Jaguar) and in Treichville and Abidjan, Ivory Coast (Moi, Un Noir, La Pyramide Humaine); the adventures of three friends in the Niger bush (Cocorico, Monsieur Poulet); and the sensibilities and observations of Africans migrating to Paris and back, what some have called reverse ethnography (Petit a Petit, Madame L'Eau). He also played an active role in helping to launch African cinema. According to stories widely reported, Rouch adopted the hand-held style after losing his tripod in a river in Niger. In the landmark CHRONICLE OF A SUMMER (1961), Rouch and his co-director Edgar Morin asked Parisians the simple question, "Are you happy?" The answers created a stunning document of contemporary life in the city. In 1998, Rouch attended New York's Docfest, where he presented a screening of CHRONICLE OF A SUMMER and participated in a discussion about cinéma-vérité filmmaking with Al Maysles and D.A. Pennebaker. "A film is a thing you can touch and smell," he said at the time, "It's a sort of love affair." "Rejecting both the idealism of Robert Flaherty and the didacticism of Joris Ivens and John Grierson, Rouch aimed for the immediacy of television, without its superficiality," wrote Ronald Bergan in The Guardian, in one of the many obituaries about the filmmaker. "He believed that the camera's intervention stimulated people to greater spontaneity, expression and truth without asking them, as in the American Direct Cinema, to act as though the camera was not there." Continuing with a quote attributed to the director, the paper added, "The camera eye is more perspicacious and more accurate than the human eye," he said. "The camera eye has an infallible memory, and the filmmaker's eye is divided." The Human Pyramid - At a Lycée on the Ivory coast, Jean Rouch meets with white colonial French high-school students and their black African classmates (all non-actors) and persuades them to improvise a drama. Jaguar - Three young Songhay men from Niger journey to the Gold Coast (modern day Ghana). After filming the trip in mid-1950s, the four reunited a few years later to record the sound, remembering dialogue and making up commentary. The Mad Masters - A possession ritual of the Hauka religious sect using the delirious techniques of "cine-trance" also doubles as a theatrical protest against Ghana’s colonial rulers. Mammy Water - An exploration of the spiritual traditions of a fishing village on the Gulf of Guinea. When the catch is bad, villagers must honor the water spirits, or Mammy Water, with a ceremony. Jean Rouch, the Adventurous Filmmaker - A new documentary about Jean Rouch and his African films.